By the time of the 5th Concerto Bach was about to be married, madly in love, starting his new expanded family - and grateful for the help of a beautiful young woman after having only year before found himself shockingly alone. Ana Magdalena and Bach worked together for the rest of their lives both as parents and colleagues. We must assume that Ana Magdelena was instrumental in creating the atmosphere that allowed Bach's genius to flourish. I like to think of the 5th Concerto to be the one where he and the true love of his life Ana Magdalena know they are meant for each other, and a future filled with music and children. I also like to think this is the point at which Bach had time for gratitude to those who helped him through these rough times. Everybody needs a hand now and then. 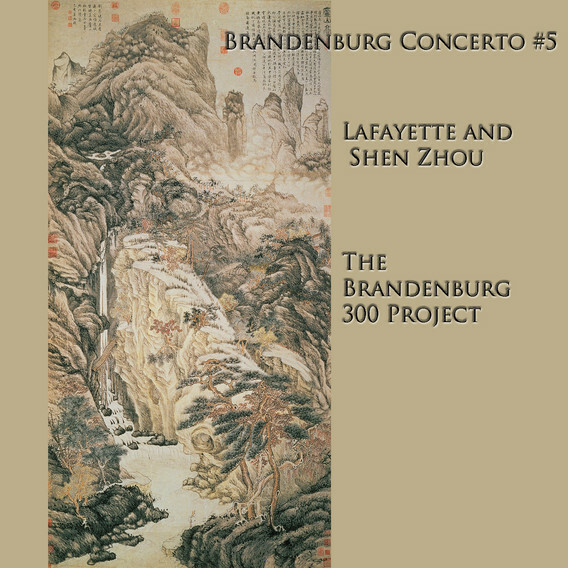 In the 5th Concerto we honor the great 15th century artist Shen Zhou, and Lafayette - the man who saved the American Revolution. When the new America needed a helping hand to win its independence, it was Lafayette who obtained the crucial needed support.